I can’t believe I am standing here receiving this award. I always thought of myself as just a trench worker, and never ever had a wild dream of this happening to me. I’m just a worker not looking for glory. Just enjoying what I was doing…helping the AHS and helping those who asked. When Mike called to notify me of the Summers’ award I was speechless. You’re very lucky; I’m still speechless, but I DO have to say, something if you can understand my NE accent. Thought I would tell you what it was like when radio was very difficult to receive, and there was no internet or TV, and there was prohibition. No batteries to run anything. However, my childhood was not typical in many ways, as you shall see, but we DID entertain ourselves. I grew up in the 1930’s, with a brother a year younger. My father was very strict. I was not allowed to go play at friends’ houses after school, but we could disappear for hours in the woods and fields. That was OK. Fresh air was good for us, so we had to play outside until dinner time. My brother and I got along well, and people in town thought we were twins. Bob, my brother, took a liking to trek through the woods, and that led to setting snares, trapping wild animals, mainly skunks. So, of course I had to go too. Have you ever faced a trapped skunk? Carefully I assure you. Very carefully you can creep up and whack it, but it didn’t always work that way. Bet none of you has ever been approached by the school principal and told to go home and take a bath. When I said I already did, he said take another. Ten baths wouldn’t have helped much at that point, but I didn’t push it. He obviously didn’t know skunks. I’m sure you want to know what we did with the skunks and rabbits we caught. We skinned them and took them to the rendering factory. They paid us for the pelts. Bless my mother. She drove to the rendering factory with the hides tied to the back of an old Buick. It must have been a sight to behold. Anyway, in trekking through the woods I learned about nature, birds and their nest, and flowers and wildlife in general. I will never forget climbing a tree and finding a Wood Ducks nest, and in those days Ring Necked Pheasants roamed in large numbers. We never disturbed any nests or plant growths. We just absorbed nature, and did we ever learn things, little things you don’t find in books. After college I worked as a chemist at Massachusetts General Hospital, and then a year at the medical school division of Grace New Haven Hospital doing research. I was forced to leave the chemistry lab, as I was born with a genetic tremor which does not help in pipetting and careful liquid measurements, etc. in the chemistry lab. So, I looked around for a new vocation. A friend in town, who had been a patient of my father’s had a small greenhouse business, and he needed help part time. I liked it and learned a lot about propagating and the greenhouse business. Eventually, I bought into the business, as he was very old by then. Way back then, Begonias, coleus , ageratum, etc were only grown from cuttings. I sold rooted cuttings of these to other greenhouses all along the Eastern seaboard. Things have sure changed. Now there is seed for most everything. I was completely absorbed in this business for 30 years and learned a lot about many types of plant life. I also grew perennials and sold them wholesale, as well as retail. One day, I saw some hosta in a catalogue and asked the salesman about them; he was a complete blank. So I chose a few anyway and planted them in my field at work, and they grew well. When I divided them each year, they sold like hotcakes. Can’t remember what they were, but the names have been changed, I think. That was my introduction to hostas. From May 30th (free of frost threats by then ) until late September we planted, weeded, hoed, and fertilized a fair size vegetable garden. One field of corn and potatoes, and the upper field tomatoes, hilled plants, carrots, and more. Here, I learned about vegetable insects and diseases. In the fall, we had to help can corn and tomatoes after school. There was no freezing in those days. We had enough corn and potatoes to last our family of four the winter. As time went on, we went to high school and I played high school sports after classes and then did my homework when I got home, but my brother kept roaming the woods, no trapping though. When he got home he copied my homework when needed, as we were in the same grade in high school. He did alright though, as he became a doctor. One day, a friend came to me and said,” WE are going to a Hosta meeting.” I was given no choice here. She had seen an ad in the newspaper. I think it was at the second meeting I met Mildred Seaver and Connie Williams. Had no idea who they were, but I soon found out in other meetings. I knew nothing about hostas, but I soon learned. People were so helpful, and I got catalogues and filled spaces in my garden and they grew well, as I have good soil, in spite of all the rocks we have in New England. I made many friends along the way, and my lawn has been getting smaller ever since. As time went on, I got more involved in the New England Hosta Society and went to Conventions. 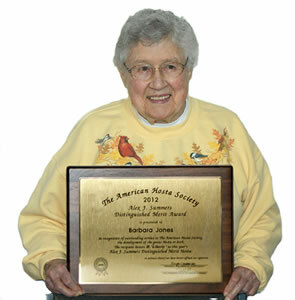 One day, I found myself appointed chair of the Benedict awards for the AHS. It took us two years to get a program ready. I gave that program my best for ten years. It has been a tough fight getting it going, as we received no help from the AHS in advertising, but I hope it will succeed for many years to come. It disappoints me when I talk to a group of AHS members, and they have no idea what the Benedict Award is. Someday, I hope it will match the Iris and Daylily awards. I wish it the best and hope it works for years. 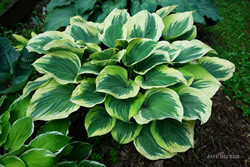 I have enjoyed my years as a member of the AHS, and I also belong to a number of other societies, but hostas have always come first, if there was a conflict in dates. The AHS has given me some very good lasting and true friends. I thank all who worked to get this award for me. I have no idea how it is done, but this is one of the proudest moments of my life, and sometime in the future I will fully realize that this award has really happened to me. Thank you all for giving it to me. Now, I have to pick my Hosta of Merit for the year.